Ligia Podorean-Ekström born in Transylvania, Romania. Lives and Creates in Sweden and Romania. Graduated from Bucharest school of architecture 1958; Illustrated several books and brochures.1977 The Romanian Publishing House "Sport-Tourism" Bucharest, published the art album: Ligia Podorean-Ekström "Lights of the North", including 72 watercolors2000 The Swedish Publishing House "World of Art" (Creative Minds of World of Art), published the art album: "The Art of Ligia Podorean-Ekström -Memory Traces" including more that 300 watercolors. 65 X 42 cm. / 25½ x 16½ in. 70 X 50 cm. / 27½ x 19½ in. 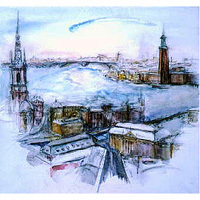 4 .STOCKHOLM, the Venice of the North I, 1998 WATERCOLOR ON CANVAS 100 x 100 cm./ 40 x 40 in. 5. 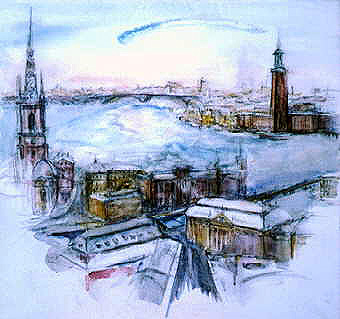 STOCKHOLM, the Venice of the North II, 1998 WATERCOLOR ON CANVAS 120 x 100 cm./ 47½ x 39½ in. 6. 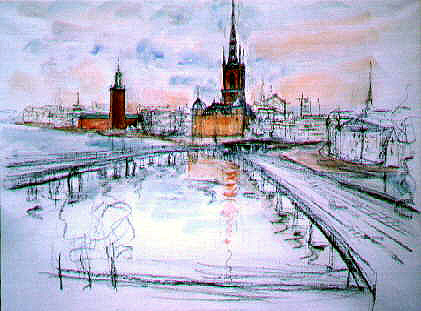 STOCKHOLM, the Venice of the North IIi, 1998 WATERCOLOR ON CANVAS 120 x 100 cm./ 47½ x 39½ in. 1970 The annual fine art award of the Architects Union of Romania. 1989 Award for town planning architecture project Strängnäs Sweden. 1994 Award the Honorary Mention at the 1st Int’l Female Artist’s Art Exhibition, Art Addiction Sweden. 1996 Honourable Mention, The 4th International Exhibition of Miniature Art, Art Addiction Gallery, Stockholm, Sweden. 1997 Diploma of Excellence, "We are different", The 4th International Female Artist's Art Annual, Art Addiction Gallery, Stockholm, Sweden. 1998 Diploma of Excellence, Femina Project "We are different": "A better World for our Children", International Female Artist's Art Exhibition, Art Addiction Gallery, Stockholm, Sweden. 1998 Award the Diploma of Excellence at the “Masks in Venice” Italy. 1999 Award the 1st Diploma of Merit at the Spring Annual in Venice Italy. 1958-76 Architect and urbanism for several projects of town planning in Romania. 1962-63 Drawing and art decoration at the Jasi art school in Moldavia Romania. 1964 Perspective at the civil engineer high school in Jasi. 1977 Married the Swedish writer Per-Olof Ekström and emigrated to Sweden. 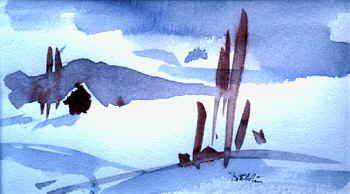 1983-92 Teaches watercolor painting at art schools in Sweden. 1985: Arranges painting courses for Swedish architects in Romania. 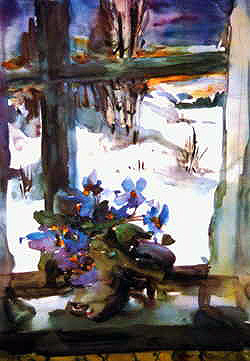 1987-89 Teaches watercolor, drawing, art history at the Academy of Art of Närpcs Finland. 1987 Starts her private architecture office and art office in Sweden. 1989-93 Employed as architect and artist by Stjernan Architect AB Stockholm Sweden. 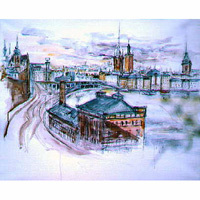 1988-98 Arranges several courses in watercolor in Sweden, Finland, Denmark and Switzerland. 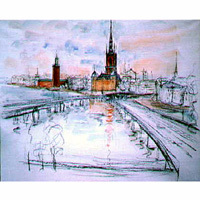 1989-93 Arranges several private courses in watercolor technical presentation of architectural projects for architects in Sweden and Denmark. 1991 Works at the architecture project “Stockholms förnyelse”. 1994 Works at the project “Sarajevo Now”. 1979-80 Stockholm and Mantorp Sweden, Ribe and Viborg Denmark, Bucharest and Art Museum Constanta Romania. 1983-84 Toronto Canada, Heidelberg Germany, Stockholm, Östersund Sweden, Vienna Austria. 1981 Art Association of Foreign Artists in Stockholm Sweden. 1981 Svea gallery 20th anniversary, Stockholm Sweden. 1988 Borlanges Art Fair Sweden. 1991 The Art Fair of Neuchatel Switzerland. 1993-97 The 1st, 2nd, 3rd, 4th, and 5th Int'l Exhibitions of Miniature of Art, Art Addition Int’l Gallery,Sweden. 1994-97 The 1st, 2nd, 3rd and 4th Int'l Female Artist’s Art Exhibition, Art Addiction Stockholm Sweden. 1997 “A Better World for our Children” Int'l Female Artist’s Art Exhibition, Art Addiction Stockholm Sweden. 1998 The 1st and 2nd “Masks in Venice” small forms int'l art exhibition Palazzo Correr / Art Addiction Venice Italy. 1998-99 The 1st and 2nd Autumn Annual in Venice, small forms int'l art exhibition Palazzo Correr / Art Addiction Venice Italy. 1999 The 1st Spring Annual in Venice, international art exhibition Palazzo Correr /Art Addiction Venice Italy. 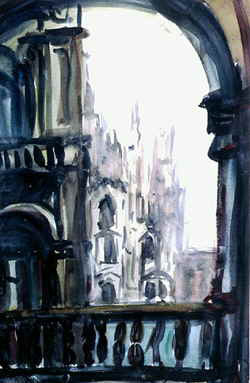 1999 The 2nd Autumn Annual in Venice, int’l art exhibition Palazzo Correr /Art Addiction Venice Italy. 1964-76 Six individual watercolor exhibitions in Bucharest Romania. 1977 Malmö, Stockholm and Östersund, Sweden. 1977 Ribe Art Museum Århus, Silkeborg and Abenra Denmark. 1981 Sibiu and Brasov, Romania. Stockholm Sweden. Århus Denmark. 1988-89 The Museum of Stundars Finland. 1991 The National Art Museum of Brasov Romania. 1993 Geneva Switzerland. 1995 Guest exhibition at the foreign Ministry in Bucharest Romania. 1996 Greek Culture Center in Stockholm. 1997 Gallerie de la Fontenette, Geneva Switzerland. 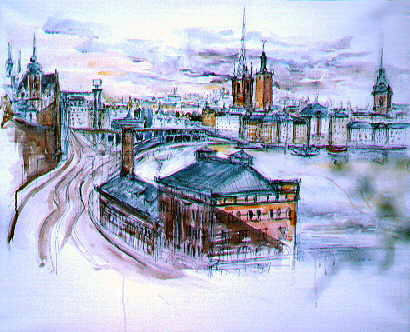 1998 Galleri Panorama Art, Stockholm. 1999 Galleri Svarta Sofan, Stockholm. 2000 Art Museum Brasov Romania. National and Corporate collections round the world: Romania, Sweden, Denmark, Finland, Switzerland, Germany, Austria, France, Spain, Italy, Canada and USA. Architecture School Stockholm, Goteborg, Åirhus, Sweden; University of Stockholm - Town planning, Sweden. Kulturhuset and various cultural associations in Sweden. 1984 Toronto Canada. 1985 Milano, Padova, Modena, Italy. AAIAA -Art Addiction International Art Association.